CThere are special times in our day-to-day lives - times to be shared and treasured. Perhaps, since we live on 'boat time' and not the normal 'busy, busy, busy' time of most folks, we have the opportunity to share experiences more fully with others. -----"Come on in, Bill. We need to talk." These words were spoken by a bright-eyed smiling man with an open shining face. 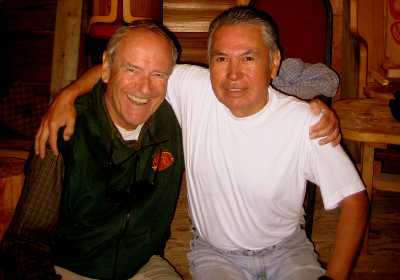 I immediately felt that warmth of recognition one feels when re-meeting a long-lost friend. "I'm George," he said with an open and direct look into my eyes as we hugged in friendship and trust. 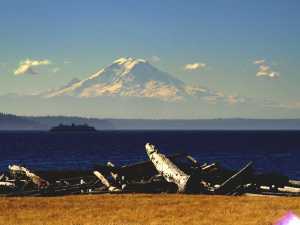 -----We had landed on Blake Island, across Puget Sound from Seattle. Friends had recommended a stop there. "It's early in the morning on a weekday - perfect timing," the voice of Catman came through the cellphone. 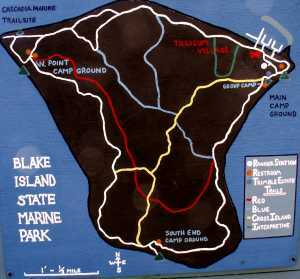 "Stop at Blake Island. It's a special place." -----And it is a special place. 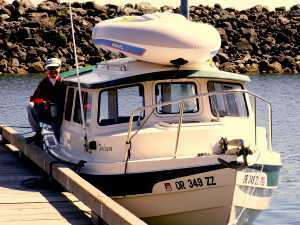 We slid between the markers of the narrow entrance channel and soon we were tied to the dock at Tillicum Village. 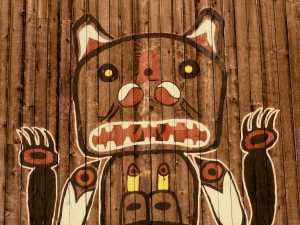 -----The painted end of a longhouse faced the dock with marvelous paintings that aroused the spirits within. We were glad we had our morning coffee before greeting the spirit people. 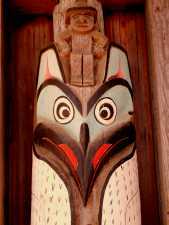 -----Carved poles, many with dramatic painting, filled the space near the long house. 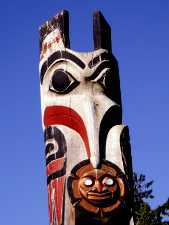 The carvings were intricate and exuded feelings of power, respect and awe. We knew we were privileged to be in a special place. 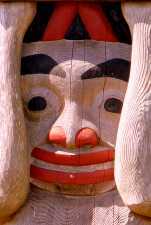 ----- And it was special because of George -- the carver of many of those totems. We had a delightful time chatting like old friends. 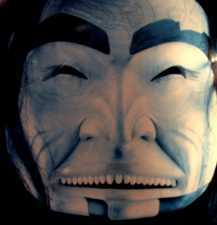 He told us of his life, the olden times, the traditions of his people. 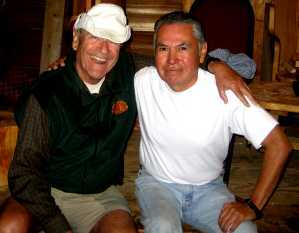 He shared personal tales and we had a warm sharing time together. 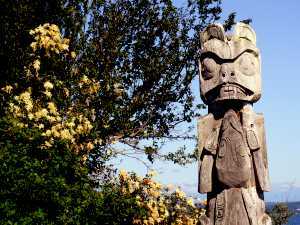 He explained the large pole, he carved, that stands in front of the visitor center. ----- When we three parted, there was a touch of sadness and loss - one last photo for us to remember a very special person. 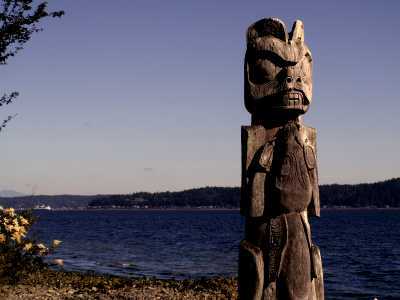 ----- Blake Island was and is a special place for native people, and is now protected as a state park. 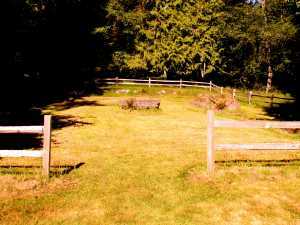 It is possible that Chief Seattle was born here as Sealth, around 1786, according to George Vancouver's records. 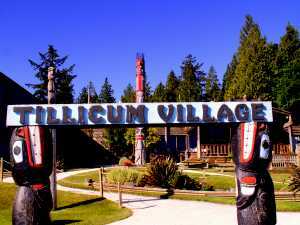 The island was favorite place for the Suquamish tribe. 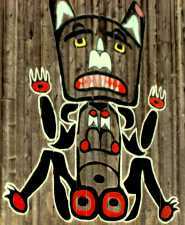 Sealth was a successful warrior, at age 22, against hostile mountain tribes. 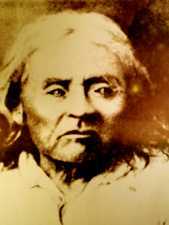 He was made chief of six allied coastal tribes. 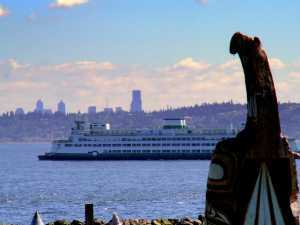 He was a friend of early European settlers and they honored him by naming their new city, Seattle, after him. He was tall, stately, and had a resounding voice that earned him respect throughout his life. He died in 1886. On his death bed he said "Death. There is no death, only a change in worlds." 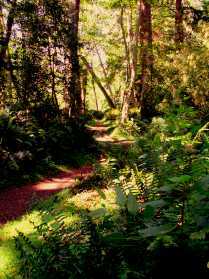 ----- The island was extensively logged in the mid-1800's. 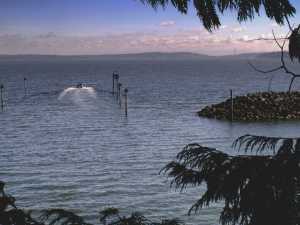 Later, it was purchased by William Trimble, a Seattle real estate magnate. He built a two-story twelve-room house with five fireplaces. Mrs. Trimble had a passion for gardening. 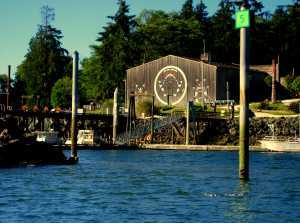 She also collected and housed a collection of Northwest History. 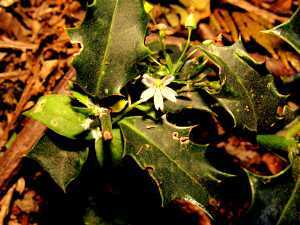 Later in life she turned the island into a National Wildlife Refuge. 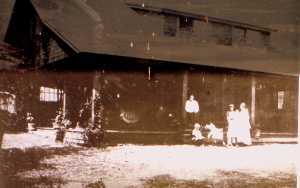 After she died in 1929, William never returned to the island. The abandoned house was vandalized and eventually burned. 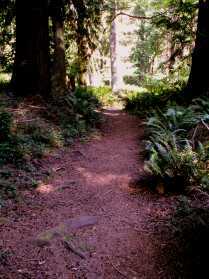 ----- Blake Island has beautiful trails to walk and deep woods to appreciate. It is a special place, with views of Mt. 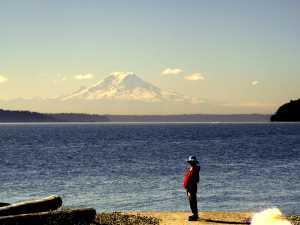 Rainier, Seattle, ferries, shorelines, and forests. ----- We left the island with regret, but we also left a bit of ourselves there and an imprint on our hearts remains.